4Easysoft Mod to MP4 Converter is the professional MOD to MP4 Converter especially designed for converting MOD/TOD to MP4 video and some other video formats. Then you can import the converted MP4 video to our MP4 player for enjoyment. Additionally, 4Easysoft MOD to MP4 Converter has the function of video editing, such as trim, crop, merge, watermark and adjust the effect. With these delicate editing functions, you can freely recreate the output video before converting MOD to MP4. 4Easysoft MOD to MP4 Converter can easily convert MOD to MP4 video. Moreover, it totally supports converting TOD, MPEG, MPG, MP4, VOB, etc. to MP4 and some other video and audio formats. Select a variety of output formats simultaneously from source file, 4Easysoft MOD to MP4 Converter can help you convert them at the same time, so as to save you much valuable time. With the powerful Mod to MP4 Converter, you can enjoy converted MP4 video on computer or other digital devices supported MP4 format, such as iPod, iPhone, iPad, Apple TV, BlackBerry, Gphone, PSP, Zune, Walkman, Creative Zen, iRivier, Archos and other MP4/MP3 players. 4Easysoft MOD to MP4 Converter enables you to adjust video brightness, contrast and saturation to get the video visual effect you want. Checking "Deinterlacing" helps you remove some jaggedness. Split movies by presetting the exact start and end time, or just dragging the slider bar. Also this software allows you to change the video aspect ratio and zoom mode to make the video screen suitable for your MP4 player. 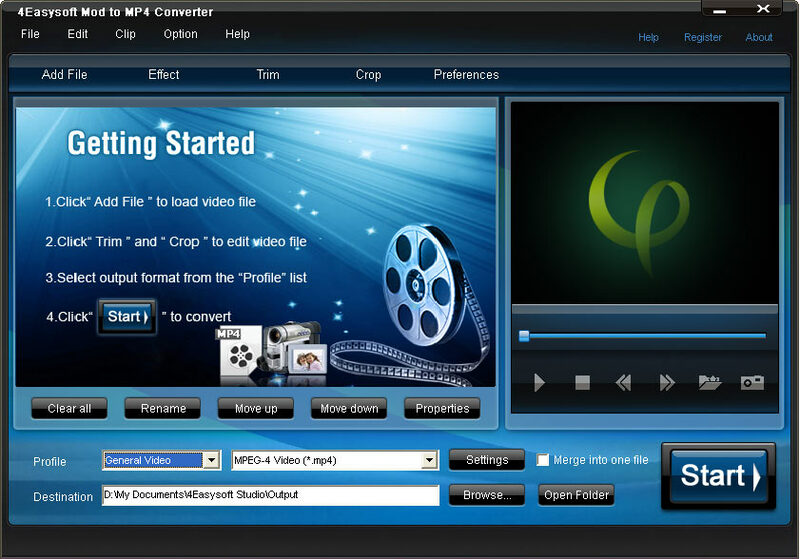 This MOD to MP4 Converter can help you join several MOD video together to output one MP4 video. To personalize your MP4 video, you can add text or image watermark to it before converting. The position and transparency of watermark can be specified as you like. Detailed video and audio settings are provided by MOD to MP4 Converter for you to adjust, such as Video Encoder, Resolution, Frame Rate, Video Bitrate, Audio Encoder, Sample Rate, Channels, Audio Bitrate. You also can save all the output settings as your preference for later use. This MOD to MP4 Converter allows you to choose audio track and subtitle for the converted video. 4Easysoft Mod to MP4 Converter has the intuitive interface, simple converting process and advanced encoding and decoding technology, which can help you convert MOD to MP4 easily and quickly with best quality.